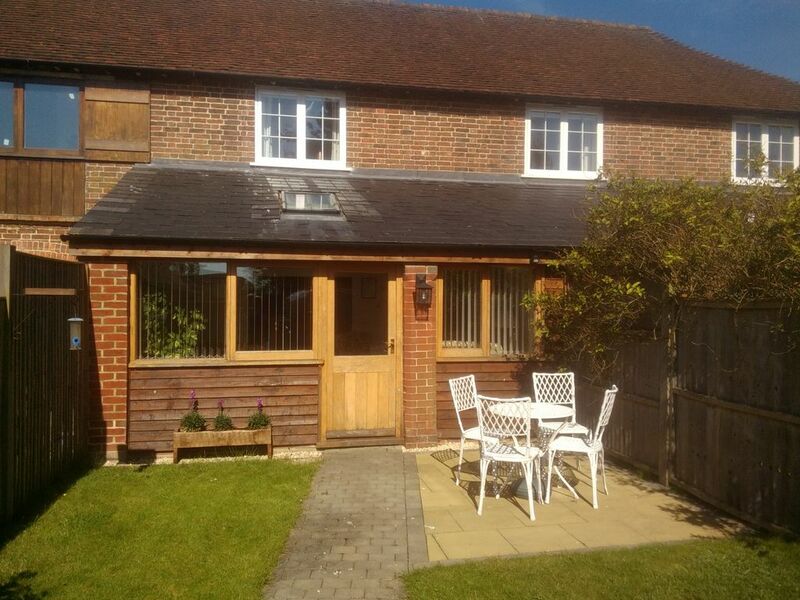 Wheat cottage is a super cottage situated in the heart of the Sussex countryside. Sympathetically converted from a former grain store into a spacious holiday let, ideal for couples wanting to relax and explore the area. Under floor heating downstairs makes the property warm and cosy on those colder winter days , and a sun room at the front of the property to relax in and a dining area , with a modern open flow into the lounge / kitchen. The bedroom upstairs is large, and has a super king bed that can be divided into to singles if necessary . Two access doors into the bathroom , one from the bedroom and one from the top of the stairs. The bathroom has a shower above the bath , and a heated towel rail too. This property still as the charm and character from its original structure and has combined it into making a very comfortable yet modern interior. we would prefer you use the line outside when possible or the drying rack. one large sofa and 1 chair , tv and dvd , with a selection of books to read too. fridge, small freezer inside fridge, microwave, washer/dryer, kettle, gas hob, electric fan oven, toaster, grill in oven. Absolutely delightful cottage, perfect in every way for our visit to East Sussex. Thank you, we look forward to returning. Gorgeous house equipped with everything you could possibly need and spotless clean. Very large comfy bed. Nice garden to sit out in. We loved Wheat Cottage. It had everything we wanted and was very comfortable. Katie welcomed us and provided excellent local information. We recommend Wheat Cottage if you want quiet, modern self-catering accommodation. Thank you for your comments, although we are used to a five star rating I would always welcome your comments as to why we didn't quite meet that. We had several reason to go to Sussex, by staying in a cottage we were free to come and go and as well as doing all that we set out to do we went for two long walks in the local area. The two of us and our dog had a lovely stay in Wheat Cottage. The cottage is spacious, clean and modern and we would definitely recommend it. There is ample parking just outside the small, fenced garden and the property is just off a narrow but quiet road. A car is essential. The position is ideal for visiting the charming town of Lewes, the Downs, Charleston and Monk's House, Beachy Head and the Birling Gap, as well as Brighton and Eastbourne. There were also nice walks locally for our dog, including part of the Vanguard Way. Chiddingly is a five minute drive away and the Six Bells is a busy but charming pub that serves good food. Katie was very helpful and friendly and knowledgeable about the local area. Thanks, Silvia, Kevin and Sofia the dog. Thank you for your lovely review, and I hope you know your wheat from your Barley now ! farming courses available from next year! My friend & I stayed in this super cottage for three nights. Lovely location with some pretty walks around the area. We had our dogs with us as we were competing at a Trial on Beachy Head. We were made very welcome & saw our host & hostess regularly who were busy putting the finishing touches to the property next door. The cottage had everything we required & we both thoroughly enjoyed our stay. Some good weather enabled us to sit out into the evening & have our breakfast in the front patio area. Thanks for a great stay. We didn't go out to eat at night but enjoyed the cottage with "dine in meals" . Supermarkets are not far away but you do feel as if you are miles from anywhere!!! The property was clean & very pleasant. We hope to be back next year! Thank you for your comments, I'm so pleased that you enjoyed your stay, and enjoyed a few walks available nearby. Hope to see you next year, with another trophy ! We are perfectly located here for visiting many of the historic sites around Sussex , Kent and Surrey. Lewes castle , Battle abbey , and Herstmonceux castle are close by. Brighton and Eastbourne are easy to drive to, and many footpaths from the cottage lead to some very decent pubs!